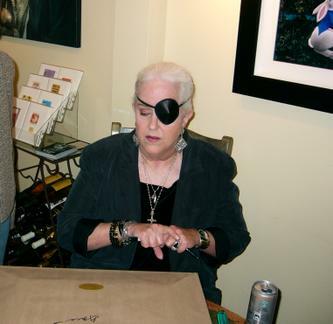 Tonight I went to a reception for Grace Slick at Gallery 319 in Santa Monica. It was a very nice event. I had the chance to speak with Grace briefly. She was very friendly and quite funny. When I told her that I liked her "Sting" piece, she said something to the effect that he was one of the few older rockers that she doesn't mind seeing perform. For a schedule of Grace Slick art events in the next few months, see the Area Arts Website. For more Grace Slick art links, see the Pop Life Art home page.